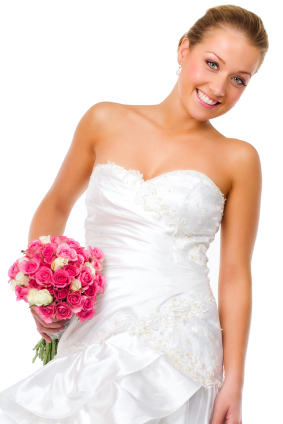 How important is your smile on your wedding day? Well, February came in like a lion and is actually leaving like a lion as well! Looking at all the white sparkly snow of course makes your friends at Dakota Dental Apple Valley dentistry think of beautiful white sparkly teeth! We’re hearing that Cupid distributed a fair amount of glittery engagement rings this past month! So, with romance and upcoming weddings in mind, your Dakota Dental Clinic friends thought we’d chat with you about how important your smile is on your wedding day. A study conducted on 1,000 American men and women between 18 and 50 years of age reflected that 94% of them felt that a person’s smile was their most significant facial feature. Wow! This statistic along with the fact that for most of us, we’ll never have more photos taken of us on a single day than on the day of our wedding, makes preparing your smile a must on your wedding planning checklist! So, along with finding that perfect wedding gown, growing your hair to the ideal length for an updo and picking out a classy tux, don’t forget to allow time to beautify your smile. The staff at Dakota Dental Family Dentistry has a passion not only for achieving optimal dental health but also for helping you have the most attractive winning smile. Teeth Whitening: Everyone’s teeth become stained from drinking coffee, pop, teas and wines along with the staining effect of foods. Teeth also just yellow with time. You can have gorgeous, bright white teeth in very little time. Smile Makeovers: It’s possible and probably easier than you think to recreate your smile into what you’ve always wished it would be. At Dakota Dental Apple Valley Family Dentistry, we have the expertise to help you have the smile you always wanted. Crowns: New porcelain dental work technology is truly amazing and creates a beautiful appearance. Porcelain Veneers: These ultra-thin layers are applied to the surface of your tooth. Veneers can change the size, shape or color of a single tooth or they can transform your entire smile. Bonding: This dental service improves the appearance of misshapen or misaligned teeth. Replacing Fillings: Older fillings sometimes darken and become less esthetic with time. We can replace them with tooth-colored fillings that are more attractive. Invisalign: Dakota Dental Clinic has been awarded the Preferred Provider Status for the fourth year in a row. With Invisalign, Dakota Dental Apple Valley Dentistry can give you that smile you’ve always wanted without interfering with your lifestyle. Dr. Shelley’s and Dr. Bennett’s extensive training, education and experience with cosmetic dentistry, along with their desire to make you LOVE your smile, will send you down the aisle beaming!